FKLI Oct Futures contract rose another 4 points higher at 1238 levels as compare to previous trading session to with a total of 2,707 lots traded in the market. FKLI was mostly consolidate during trading sessions due reaction on regional equity performance as Nikkei exchange was manage to close highest while Hang Seng indices were traded sideways. 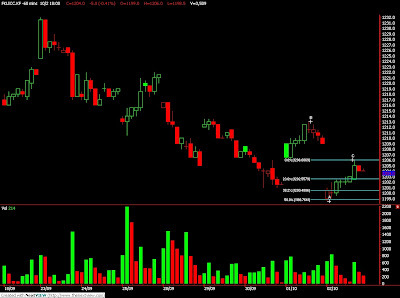 Technically, FKLI was mainly traded sideways during trading session despite was traded on the high side throughout the entire trading sessions. Based on our technical interpretation, our opinion suggests technically would trade higher in the coming trading sessions provided short term support levels at 1230 and 1223 regions were not violated during trading sessions. 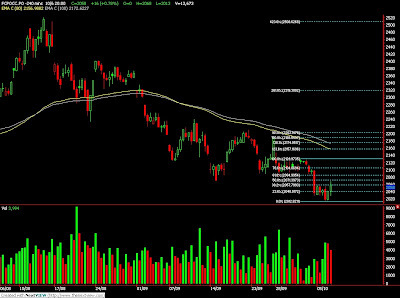 Traders were advice to long position in the coming trading sessions provided support levels must not be penetrated. Next resistance levels were expected at 1248 and 1255 regions. CPO 3rd month Dec futures contract surge RM55 higher as compare to previous trading sessions to close at RM2085 with a total of 9,010 lots traded in the market. CPO price was traded higher during last trading hours after long consolidation around RM2055 and RM2070 range despite soybean oil and crude oil electronic trading were traded red during trading session. 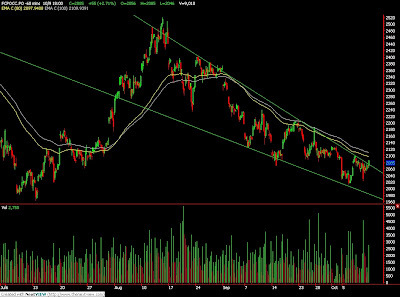 Technically, CPO price seems possible to break out from the falling wedge that formed in the daily chart and hourly chart. 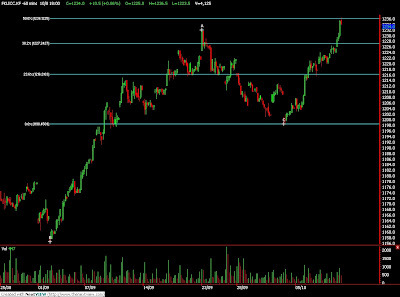 However, further confirmation needed to decide if CPO price was indeed breakout from range trading. Based on our technical view, our opinion suggest CPO price would trade higher in the coming trading sessions provided resistance levels at RM2087 and RM2130 were unable to resist the buying interest. Traders were advice to hold long position in the coming trading sessions while extra cautious around support levels at RM2057 and RM2030 regions. Oct. 9 (Bloomberg) -- Gold prices dropped, paring the biggest weekly advance since April, as a stronger dollar cut demand and some investors sold the metal to lock in gains from its climb to a record. The U.S. Dollar Index rose as much as 0.8 percent, rebounding from the lowest level in almost 14 months, after Federal Reserve Chairman Ben S. Bernanke said the central bank is ready to “tighten” U.S. monetary policy. Gold futures, up 4.4 percent this week, capped the biggest such gain since April 24, while the dollar is down 0.7 percent. “Everybody is so bearish on the dollar and so bullish of gold, the market just had to turn,” said Matt Zeman, a LaSalle Futures Group metals trader in Chicago. Gold futures for December delivery slipped $7.70, or 0.7 percent, to $1,048.60 an ounce on the New York Mercantile Exchange’s Comex division. Yesterday, the metal climbed to an all-time high of $1,062.70, setting a record for a third straight day. Bullion for immediate delivery dropped $6.60, or 0.6 percent, to $1,048.50 an ounce at 7:50 p.m. in London. “Those are key words for the gold market,” said Tom Pawlicki, an MF Global Inc. analyst in Chicago. Gold gained more than sixfold from 1977 to 1980, touching a then-record $873 in January 1980 as the U.S. inflation rate topped 14 percent. The Fed has kept its benchmark lending rate between zero and 0.25 percent since December to counter the effects of the recession. Consumer prices rose 0.4 percent in August and were down 1.5 percent compared with a year earlier, according to the Labor Department. The 14-day relative-strength index for gold futures climbed above 70 on Oct. 7, a signal that prices may retreat. The index slid to 68.9 today. Hedge-fund managers and other large speculators raised positions that would gain on rising New York futures to a record in the week ended Sept. 22, U.S. Commodity Futures Trading Commission data showed. Those bets were trimmed by 2.3 percent in the following week. Holdings in the SPDR Gold Trust, the biggest exchange- traded fund backed by the metal, were unchanged at 1,109.31 metric tons as of yesterday, data on the company’s Web site showed. The trust’s holdings are 2.2 percent below the record of 1,134.03 tons reached on June 1. Silver futures for December delivery fell 12.5 cents, or 0.7 percent, to $17.69 an ounce in New York, after touching a 14-month high of $17.955 yesterday. Oct. 9 (Bloomberg) -- The dollar advanced the most against the yen since August on speculation the Bank of Japan will trail other central banks in increasing interest rates as the global recession comes to an end. The six-currency Dollar Index recovered from a 14-month low after Federal Reserve Chairman Ben S. Bernanke said yesterday policy makers are ready to raise borrowing costs once the economy improves. Canada’s dollar was the biggest gainer versus the U.S. currency among major counterparts as employers added more jobs in September than economists forecast. The U.S. currency climbed as much as 1.7 percent to 89.89 yen, the biggest advance since Aug. 7, before trading at 89.82 at 4:04 p.m. in New York, compared with 88.39 yesterday. The dollar strengthened 0.6 percent to $1.4712 per euro, from $1.4794, paring a decline for the week to 0.9 percent. The euro increased 1.1 percent to 132.14 yen, from 130.76. The dollar remained higher versus the yen after the Commerce Department said the U.S. trade deficit unexpectedly narrowed in August as exports climbed to the highest level of the year and oil imports plunged. The gap fell 3.6 percent to $30.7 billion from a revised $31.9 billion in July. The Canadian dollar appreciated as much as 1 percent to C$1.0411 per U.S. dollar, the strongest level since September 2008, as employers added 30,600 jobs in September and the unemployment rate dropped to 8.4 percent. The median forecast of 23 economists in a Bloomberg survey was for a gain of 5,000 jobs and a jobless rate of 8.8 percent. The Canadian dollar gained 16 percent this year against its U.S. counterpart as the prospects for a recovery from the worst global financial crisis since the Great Depression sparked demand for commodities. Canada draws more than half its export revenue from raw materials. The Dollar Index, which IntercontinentalExchange Inc. uses to track the currency against the yen, euro, Swiss franc, pound, Swedish krona and Canadian dollar, rose 0.7 percent to 76.528. It touched 75.767 yesterday, the lowest since August 2008. “We’re starting to move from a regime where it’s been all about risk aversion to a more differentiated regime based on those expectations for rate hikes in other currencies,” said Vassili Serebriakov, a currency strategist at Wells Fargo & Co. in New York. The central bank will be prepared to tighten monetary policy when the outlook for the economy “has improved sufficiently,” Bernanke said at a Board of Governors conference in Washington yesterday. The Fed has probably “learned its lesson” from keeping interest rates low for too long in 2003 and 2004, said Westpac’s Franulovich. Yields on two-year Treasuries, more sensitive to changes in interest-rate expectations than longer-maturity securities, rose as much as 10 basis points, or 0.10 percentage point, to 0.98 percent, the biggest intraday increase since an 11 basis point gain on Sept. 23. White House economic adviser Lawrence Summers repeated the administration’s commitment to a strong dollar, citing recent comments by U.S. Treasury Secretary Timothy Geithner. The krone advanced as much as 0.3 percent to 5.6174 versus the dollar, the strongest level since September 2008, as Norway’s inflation rate rose last month, adding to speculation that the central bank may start raising interest rates as early as next month. The underlying inflation rate, excluding energy costs and taxes, increased to 2.4 percent, compared with Norges Bank’s 2.5 percent target. 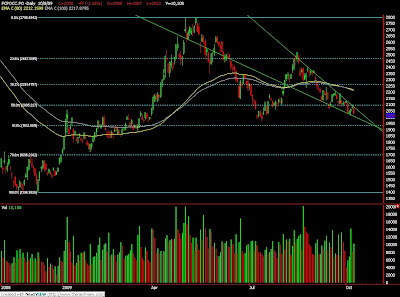 The krone later depreciated 0.3 percent to 5.6524. The yen dropped against the dollar as Japan’s machinery orders rose 0.5 percent in August, less than forecast, after falling 9.3 percent in the previous month, the Cabinet Office reported in Tokyo. The median estimate of 27 economists in a Bloomberg survey called for a 2.1 percent gain. Japan’s currency is likely to weaken over the next 12 months as “momentum” fades from a tax break on overseas earnings, according to Brown Brothers Harriman & Co. Since April 1, Japanese exporters have been able to bring back income earned outside the country without paying the combined 40 percent tax. Japan’s currency will probably slip to a range of 105 to 110 versus the dollar in the next 12 months, Chandler said. The yen rose 3.8 percent versus the dollar in September. MUMBAI, Oct 8 (Reuters) - Indian soybean and soyoil futures ended down on Thursday tracking a fall in Malaysian palm, which hit a 12-week low ahead of industry data and tracking a fall in spot prices, analysts said. Palm oil and soyoil are related commodities and their prices often move in tandem. Soybean prices in the spot market in Indore fell 1.55 percent to 19,000 rupees per tonne. Expectation of record soybean crop in Brazil, a top producer, also weighed on the markets. The new soy crop in Brazil was projected at a record 62.26 million to 63.27 million tonnes compared with the 57.09 million tonnes harvested last season, government's crop supply agency Conab said on Wednesday. Oct. 9 (Bloomberg) -- Crude oil traded little changed above $71 a barrel in New York, poised for a second week of gains, after the dollar declined and the number of Americans filing jobless claims dropped. Oil climbed 3 percent yesterday after Labor Department data showed initial unemployment benefit applications fell to the lowest since January, boosting optimism of a demand recovery in the biggest energy-consuming nation. The dollar fell to its weakest level against the currencies of six major U.S. trading partners in almost 14 months, boosting the appeal of commodities as a hedge against inflation. Crude oil for November delivery was at $71.43 a barrel, down 26 cents, in electronic trading on the New York Mercantile Exchange at 9:09 a.m. Sydney time. Yesterday, the contract rose $2.12 to settle at $71.69. Prices are poised for a 2 percent increase for the week. The Dollar Index, which IntercontinentalExchange Inc. uses to track the U.S. currency against the euro, yen, pound, Canadian dollar, Swiss franc and Swedish krona, dropped 0.7 percent to 75.966 yesterday, after reaching 75.767, the weakest since Aug. 11, 2008. Gold futures for December delivery gained $11.90, or 1.1 percent, to settle at a record $1,056.30 an ounce on the Comex division of Nymex yesterday. The UBS Bloomberg Constant Maturity Commodity Index, which tracks 26 raw materials, gained 2.5 percent to 1190.681, the highest since Oct. 3, 2008. The dollar traded at $1.4790 per euro at 9:11 a.m. Sydney time, from $1.4794 yesterday. A weaker dollar increases the appeal of commodities as an alternative investment. Brent crude oil for November settlement rose $2.57, or 3.8 percent, to end the session at $69.77 a barrel on the London- based ICE Futures Europe exchange yesterday. Oct. 9 (Bloomberg) -- The dollar rose against the yen for the first time in five days after Federal Reserve Chairman Ben S. Bernanke said the U.S. central bank is ready to “tighten” monetary policy, increasing the appeal of U.S. assets. The euro advanced against the yen after European Central Bank President Jean-Claude Trichet said yesterday the region’s economy is emerging from a period of “free fall,” damping demand for Japan’s currency as a refuge. The Australian dollar headed for its biggest weekly gain since May amid wagers the central bank will raise interest rates twice more this year after a surprise increase on Oct. 6. The U.S. currency strengthened to 88.74 yen as of 9:31 a.m. in Tokyo from 88.39 yen in New York yesterday. The dollar climbed to $1.4765 per euro from $1.4794. Europe’s single currency rose to 131.01 yen from 130.76 yen. Australia’s dollar traded at 90.42 U.S. cents from 90.62 cents in New York yesterday when it touched 90.90 cents, the strongest level since Aug. 7, 2008. The currency bought 80.21 yen from 80.10 yen. Bernanke’s comments echoed those by Kansas City Fed President Thomas Hoenig, who on Oct. 6 said raising interest rates wouldn’t derail the U.S. economic recovery. Trichet signaled the ECB will keep interest rates at a record low to spur growth. “The current rates remain appropriate,” Trichet said at a press conference in Venice after policy makers left the main refinancing rate at 1 percent. “Excess volatility and disorderly movements in exchange rates have adverse implications for economic and financial stability,” he said, reiterating the Group of Seven’s statement on currencies. The yen dropped against 15 of its 16 major counterparts as the Nikkei 225 Stock Average rose 0.5 percent, following a 0.8 percent increase in the Standard & Poor’s 500 Index in New York yesterday. Investors are certain Reserve Bank of Australia Governor Glenn Stevens will raise the overnight cash rate target on Nov. 3 by a quarter percentage point, according to Bloomberg calculations based on interbank futures on the Sydney Futures Exchange. They’re wagering on a 96 percent chance he follows with another increase in December to end the year with a cash rate at 3.75 percent. CPO 3rd month Dec futures contract fall RM47 lower as compare to previous trading sessions to close at RM2030 with a total of 10,108 lots traded in the market. CPO price trade lower before market close for trading after long consolidation around RM2080 regions as crude oil and soybean oil electronic trading were traded weaker during trading session. Technically, CPO price manage to plunge south during trading after a Doji formation in the hourly chart. Based on our technical view, our opinion suggests CPO price would likely to plunge further lower in the coming trading session where support levels seen at RM2003 and RM1970 regions. Traders were advice to hold short position in the coming trading sessions provided resistance levels at RM2077 and RM2128 must not be violated. FKLI Oct Futures contract surge 10 points higher at 1234 levels as compare to previous trading session to with a total of 4,125 lots traded in the market. FKLI was traded higher as regional indices were traded firm during trading sessions despite unfavorable news release on the Dow Jones overnight trading regarding about the deficit matter. Technically, FKLI were traded firm during trading session after manage to penetrate previous resistance levels at 1225 and 1232 levels. Based on our technical view, our analyst notice FKLI was manage to meet projected figure at 1236 levels; 50% Fibonacci resistance levels. We would cautiously think that FKLI is possible topped around 1235 regions. However, further confirmation needed to decide on trend reversal. Traders were advice to only hold short position if the resistance levels at 1236 and 1248 were not violated in trading sessions while support levels were seen at 1230 and 1223 regions. Oct. 8 (Bloomberg) -- Oil rose in New York after a government report showed an unexpected decline in U.S. crude supplies, boosting optimism about a demand recovery in the biggest energy-consuming nation. Oil pared yesterday’s 1.9 percent decline after the Energy Information Administration said crude stockpiles fell 978,000 barrels last week. A 2 million-barrel gain was forecast in a Bloomberg analyst survey. Alcoa Inc., the first Dow Jones Industrial Average company to report for the three months through Sept. 30, posted an unexpected third-quarter profit. Crude oil for November delivery gained 42 cents, or 0.6 percent, to $69.99 a barrel in electronic trading on the New York Mercantile Exchange at 11:38 a.m. Sydney time. Yesterday, the contract dropped $1.31 to settle at $69.57. Prices have gained 57 percent since the start of the year. U.S. stocks rose for a third day yesterday as banks climbed on an analyst upgrade of Bank of America Corp. and Wells Fargo & Co.’s plan to boost credit-card rates. The Standard & Poor’s 500 Index rose 0.3 percent in New York. The Dow Jones Industrial Average slipped 5.67 points, or 0.1 percent. Australia’s benchmark S&P/ASX 200 Index rose 0.3 percent at 11:03 a.m. in Sydney. Typhoon Melor smashed into Japan near the city of Nagoya, today bringing winds of 139 kilometers (86 miles) an hour and causing disruptions to fuel distribution. Nippon Oil Corp. halted shipments from a refinery in Yokohama, near Tokyo, and maritime shipments from a plant in Sendai in northern Japan, a company spokesman said. Idemitsu Kosan Co. suspended shipments of refined oil products from a refinery near Tokyo, a company spokeswoman said. In the U.S., Valero Energy Corp. said a yesterday hydrocracker was shut after a “small fire” at its Corpus Christi, Texas, refinery. A weaker dollar supported oil prices as investors turned to commodities as a hedge against inflation. The dollar traded at $1.4717 against the euro at 11:08 a.m. in Sydney, from $1.4691 yesterday. The U.S. currency depreciated earlier this week on concern the Federal Reserve will be slower to raise interest rates than policy makers in other nations. U.S. inventories of crude oil dropped 978,000 barrels to 337.4 million, the Energy Department report showed. Imports fell 4.6 percent to 9.1 million barrels a day last week. Distillate fuel inventories climbed 679,000 barrels to 171.8 million last week, the report showed. Supplies were estimated to have declined 400,000 barrels, according to the analyst survey. Gasoline stockpiles climbed 2.94 million barrels to 214.4 million. Refineries operated at 85 percent of capacity, up 0.4 percentage point from the previous week. Analysts forecast that utilization rates would drop 0.3 percentage point. U.S. refiners often schedule repairs and upgrades in September and October as gasoline consumption declines and before heating-oil use rises. Brent crude oil for November settlement gained 53 cents, or 0.8 percent, to $67.73 a barrel on the London-based ICE Futures Europe exchange, at 11:38 Sydney time. Yesterday, the contract fell $1.36, or 2 percent, to close at $67.20 a barrel on the London-based ICE Futures Europe exchange. Oct. 7 (Bloomberg) -- Record gold prices will “ruin” festive-season demand in India, the world’s biggest consumer, the nation’s largest jewelry producer and exporter said. India’s bullion imports fell for a fifth month in September to 50 tons from 54 tons a year ago, as high prices cooled demand for jewelry, the Bombay Bullion Association Ltd. said last week. Global prices must drop at least 7 percent to lure households in the country, where women are the biggest users of gold, to buy rings, chains and necklaces, Mehta said. “Unless prices drop back to $960-970 levels, Indian buyers are unlikely to make big purchases,” Mehta said. Immediate-delivery gold reached a record $1,048.43 an ounce on speculation that currencies will weaken, sparking inflation and boosting the appeal of bullion as a store of value. It was at $1,047.95 at 2:28 p.m. local time. India’s gold imports this year may decline to 300-350 tons from 450 tons last year, as prices and a drought in almost half the country following the weakest monsoon since 1972 combine to curb jewelry sales, Mehta said. Sales typically reach their highest point during the Hindu festival of Diwali, which falls on Oct. 17 this year, and the wedding season that follows. “Sales have certainly declined today,” Harmesh Arora, managing director of NIBR Bullion Pvt., which sells jewelry at Zaveri Bazar, Mumbai’s main gold market. “Rising prices have put off buyers and scrap sellers are waiting for prices to rise further,” said Arora, who is also the vice president of the Bombay Bullion Association. December-delivery gold on the Multi Commodity Exchange of India in Mumbai gained as much as 0.8 percent to 15,893 rupees ($340) per 10 grams. “The only consolation is the gain in the rupee, which has cushioned the impact somewhat for Indian buyers,” said Mehta. Rupee advanced to a one-year high today on speculation the central bank will increase interest rates to temper inflation. The currency jumped to as high as 46.515, the strongest level since Sept. 26, 2008, according to data compiled by Bloomberg. To be sure, housewives and other retail buyers may resume purchases on concern prices may gain further, C. Vinod Hayagriv, chairman of All India Gem & Jewellery Trade Federation, said. Bullion may trade between $1,000 and $1,050 an ounce in the next two months, and reach $1,100 by Christmas, he said. FKLI Oct Futures contract surge 6 points higher at 1223.5 levels as compare to previous trading session to with a total of 3,517 lots traded in the market. FKLI was traded mainly sideways despite regional indices especially Hang Seng indices and Dow Jones electronic trading were traded strong during trading sessions. Technically, FKLI successfully manage to penetrate previous resistance levels at 1219.5 regions but consolidate within 1224 and 1219 regions during trading hours. Based on our technical view, our opinion tells us that FKLI still not being able to penetrate resistance levels at 1225 and 1232 regions in order to confirm bull rally reinstate into the market. However, traders were advice to hold short position cautious if resistance levels were being penetrated while be alert around support levels at 1219 and 1213 regions. CPO 3rd month Dec futures contract rebound another RM15 higher as compare to previous trading sessions to close at RM2077 with a total of 8,157 lots traded in the market. CPO price were traded higher during earlier sessions due to crude oil and soybean oil overnight and electronic strong trading but soften in 2nd trading sessions possible due to profit taking activities. Technically, CPO daily price chart shows a Doji formation while topped below a downwards trend line; gap was seen covered at price of RM2068 regions. Based on technical interpretation, our opinion suggests CPO price would likely trading lower in the coming trading sessions where supports were seen at RM2068 and RM2003 regions. However, traders were advice to only hold short position provided support levels were being penetrated during trading session instead of attempt to short on rebound activities where resistance were seen at RM2104 and RM2130 regions. Oct. 6 (Bloomberg) -- Palm oil fell as the prospect of a record U.S. soybean crop and a bigger harvest of the oilseed in Argentina reduced concern over a shortage in edible oil supplies. Palm oil, which competes with soybean oil for use in food and fuel, has climbed 20 percent this year on concern there may be global oilseed shortage after drought damaged a quarter of the soybean harvest in Argentina, the top exporter of soybean oil. It helped U.S. farmers to plant a record crop. December-delivery palm oil lost as much as 1.4 percent to 2,013 ringgit ($586) a ton on the Malaysia Derivatives Exchange, and paused at 2,023 ringgit at the midday break. Futures fell 11 percent last month in anticipation of the U.S. soybean crop. Soybean oil, traded on the Chicago Board of Trade, is 27 percent more expensive than palm oil. “Palm oil is affordable again,” Su-Yin Teoh, a strategist at Deutsche Bank (Malaysia) Berhad, said today. Supplies of palm oil slowed in September due to the Muslim fasting month and subsequent holiday, and may pick up this month. About 90 percent of the world’s palm oil is produced in Indonesia and Malaysia, both predominantly Muslim countries. Malaysia’s palm oil output in August reached 1.49 million tons, the highest since a record set in November, according to the nation’s palm oil board. That lifted stockpiles to a six- month high of 1.42 million tons. September data is due next week. Argentina may grow 63 percent more soybeans next year than the drought-reduced harvest this year, as farmers plant less of other crops, the U.S. Department of Agriculture’s Foreign Agricultural Service said. Output may total 52 million tons in the year starting April 1, up from the USDA’s estimate of 32 million collected this year, according to the report. The USDA forecast a 2010 harvest of 51 million tons in September. Farmers will sow 18.5 million hectares (45.7 million acres), up from an estimated 17.5 million planted a year earlier, with less land devoted to wheat, corn, sunflowers and cattle pasture, according to the report. Oct. 5 (Bloomberg) -- Oil may jump above $100 next year as emerging market demand rises and “loose” monetary policy weakens the U.S. dollar, Bank of America Corp.’s Merrill Lynch unit said. The U.S. Federal Reserve cut interest rates to near zero to pull the economy out of the worst recession since the 1930s. The easier monetary policy has helped oil rebound 56 percent this year to near $70 as investors turn to dollar-priced commodities as a hedge against inflation and a weaker U.S. currency. “A vicious cycle of rising oil prices, rising capital inflows in emerging markets, continued emerging market currency appreciation and in turn higher emerging market commodity demand could trigger a sharp deterioration of terms of trade in OECD economies, putting the fragile global recovery at risk,” the analysts said in the report. Oil for November delivery fell as much as 67 cents, or 1 percent, to $69.28 a barrel in electronic trading on the New York Mercantile Exchange today. Oct. 6 (Bloomberg) -- Crude oil traded little changed near $70 a barrel in New York after rising yesterday on optimism fuel demand will increase amid improved prospects for an economic recovery in the U.S., the biggest energy consumer. Stocks climbed as a report from the Institute for Supply Management showed that U.S. service industries returned to growth after 11 months of contraction. Commodities also gained as the falling dollar bolstered the appeal of raw materials as a hedge against inflation. “The major headline supporting the rally was the September ISM non-manufacturing report showing positive growth,” said Mike Sander, an investment adviser at Sander Capital in Seattle. “Oil was pushed higher thanks to the 100 point move in the Dow Jones” Industrial Average, he said. Crude oil for November delivery was at $70.49 a barrel, up 8 cents, in electronic trading on the New York Mercantile Exchange at 10:26 a.m. Sydney time. Yesterday, the contract gained 46 cents to settle at $70.41. Prices have increased 58 percent since the start of the year. The Standard & Poor’s 500 Index added 1.5 percent in New York yesterday, its steepest gain in a week. The Dow Jones rose 112.08 points, or 1.2 percent. Australia’s benchmark S&P/ASX 200 Index increased 1.3 percent at 10:28 a.m. Sydney time. The dollar traded at $1.4651 per euro at 8:09 a.m. in Tokyo, from $1.4648 yesterday. The Institute for Supply Management’s index of non- manufacturing businesses, which make up almost 90 percent of the U.S. economy, rose to 50.9, higher than forecast, from 48.4 in August, according to the Tempe, Arizona-based group. Fifty is the dividing line between expansion and contraction. U.S. crude-oil inventories probably rose last week as refineries performed seasonal maintenance, a Bloomberg News survey showed. Stockpiles increased 2 million barrels from 338.4 million in the week ended Oct. 2, according to the median of 11 estimates by analysts before the department’s report tomorrow. Refiners often idle units for repairs and upgrades, known as turnarounds, in September and October as gasoline demand drops and before heating-oil use rises. Crude-oil imports fell 2.7 percent to an average 9.53 million barrels a day in the week ended Sept. 25. Supplies of distillate fuel, a category that includes heating oil and diesel, declined 400,000 barrels from 171.1 million the prior week the survey showed. Stockpiles in the week ended Sept. 25 were at the highest level since 1983. The Energy Department is scheduled to release its weekly report at 10:30 a.m. tomorrow in Washington. Brent crude oil for November settlement dropped 3 cents to settle at $68.04 a barrel on the London-based ICE Futures Europe exchange yesterday. Oct. 5 (Bloomberg) -- Gold futures touched the highest price in more than a week as the dollar weakened, boosting the appeal of the precious metal as an alternative investment. The greenback fell as much as 0.5 percent against a basket of six major currencies. Gold has gained 15 percent this year, while the dollar declined 5.7 percent. “The dollar is moving a little lower, and that’s giving gold a pop,” said Matt Zeman, a LaSalle Futures Group metals trader in Chicago. Gold futures for December delivery climbed $13.50, or 1.3 percent, to $1,017.80 an ounce on the New York Mercantile Exchange’s Comex division, the highest settlement price for a most-active contract since Sept. 16. Earlier, the metal reached $1,018.90, the highest price since Sept. 24. The U.S. Dollar Index, which includes the euro and yen among the currencies of six U.S. trading partners, has dropped 14 percent from a three-year high of 89.624 on March 4. Futures reached $1,033.90 on March 17, 2008, the all-time high in New York. In London, gold for immediate delivery climbed $13.80, or 1.4 percent, to $1,016.60 an ounce at 7:06 p.m. local time. Holdings in the SPDR Gold Trust, the biggest exchange- traded fund backed by the metal, rose 1.22 metric tons to 1,096.55 tons as of Oct. 2, data on the company’s Web site shows. Hedge-fund managers and other large speculators trimmed their bets on rising New York futures in the week ended Sept. 29, the U.S. Commodity Futures Trading Commission said last week. Net-long positions fell 2.3 percent to 231,386 contracts. A decline in open interest may have attracted investors, said Chip Hanlon, the president of Delta Global Advisors in Huntington Beach, California. Still, gold may be too expensive to lure buyers when it rises past $1,000, LaSalle’s Zeman said. Silver futures for December delivery rose 30.5 cents, or 1.9 percent, to $16.535 an ounce on the Comex. The metal is up 46 percent this year. Oct. 6 (Bloomberg) -- The euro advanced for a third day against the dollar before a government report forecast to show German factory orders rose for a sixth month in August, boosting demand for higher-yielding assets. Europe’s single currency rose against 13 of its 16 major counterparts as Asian stocks extended a global rally. Australia’s dollar fell after a government report showed the nation’s trade deficit was wider than economists had estimated. The euro climbed to $1.4659 at 9:57 a.m. in Tokyo from $1.4648 in New York yesterday. It rose to a one-year high of $1.4844 on Sept. 23. The euro fetched 131.08 yen from 131.15 yen. Japan’s currency traded at 89.41 per dollar from 89.53. The Dollar Index, which the ICE uses to track the dollar against the currencies of six major U.S. trading partners including the euro, dropped 0.1 percent to 76.646. It declined 0.4 percent yesterday. The Economy Ministry in Berlin is forecast to report Germany’s factory orders advanced 1.1 percent in August following a 3.5 increase in July, according to the median estimate of economists in a Bloomberg News survey. The data is due tomorrow. The dollar fell against the euro as the Nikkei 225 Stock Average rose 0.3 percent and the MSCI Asia Pacific Index of regional shares gained 0.6 percent, weakening demand for safe- haven currencies. The Standard & Poor’s 500 Index yesterday advanced 1.5 percent after Goldman Sachs Group Inc. raised its view on banks including Wells Fargo & Co., JPMorgan Chase & Co. and Bank of America Corp. to “attractive” from “neutral.” A report showed U.S. service industries expanded in September for the first time in a year. Australia’s dollar weakened versus 14 of 16 major counterparts after the Bureau of Statistics said today the August trade deficit narrowed to A$1.52 billion ($1.33 billion) from a revised A$1.78 billion in July. The median estimate in a Bloomberg survey of 19 economists was for a A$900 million shortfall. Australia’s currency fell 0.1 percent to 87.68 U.S. cents, paring yesterday’s 1.5 percent gain. The Reserve Bank of Australia will decide on its benchmark rate at 2:30 p.m. in Sydney. Benchmark interest rates are as low as zero in the U.S. and 0.1 percent in Japan, compared with 1 percent in the euro zone and 3 percent Australia. In carry trades, investors sell currencies in a nation with low borrowing costs and buy assets where returns are higher. The risk in such trades is that currency market moves will erase profits. The Australian dollar may drop toward the weakest in nearly 10 months against the New Zealand currency as it risks a “bearish breakdown” on a decline below support at NZ$1.20, according to JPMorgan Chase & Co.
Australia’s currency will target a slide to NZ$1.1675, the least this year, if it falls under “deeper support” at NZ$1.1875, wrote Niall O’Connor, a technical analyst at JPMorgan in New York. The NZ$1.20 level is near the 38.2 percent Fibonacci retracement of the Australian currency’s advance to this year’s peak of NZ$1.2942 on April 30 from last year’s low of NZ$1.0648 reached on Oct. 10, 2008. CPO 3rd month Dec futures contract rebound marginally RM5 higher as compare to previous trading sessions to close at RM2042 with a total of 6,777 lots traded in the market. CPO price were traded sideways during trading sessions after being sell down fiercely during last week last trading sessions. 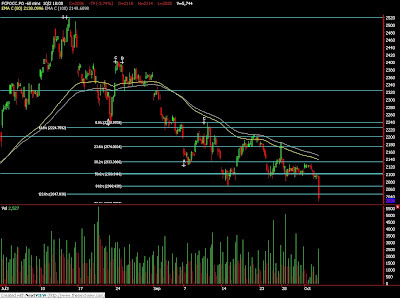 Technically, CPO price seems consolidating within range from RM2030 towards RM2060 regions as 100% Fibonacci support levels seen at RM2040 regions. Based on our technical view, our opinion suggests CPO still doesn’t show any sign of reversal in the 4-hourly price chart while we suggests strong support levels possible to be found around RM1970 and RM1930 regions. However, traders were advice to hold long position in the coming trading sessions if resistance levels at RM2082 and RM2130 were violated during trading sessions. FKLI Oct Futures contract surge 12 points higher to settle at 1216 levels as compare to previous trading session to with a total of 2,860 lots traded in the market. FKLI was traded higher before sessions were closed as Dow Jones futures electronic trading surge higher despite it was more a range trading day for regional indices. Technically, FKLI manage to break previous upper resistance trend lines at 1206.5 and 1203 regions. Based on chart pattern in technical analyst, our opinion suggests FKLI were seems likely to reverse towards uptrend after manage to break previous high resistance levels at 1213.5 regions. 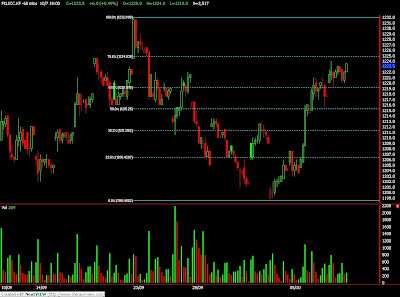 Traders were advice to hold long position in the coming trading sessions provided support levels at 1207.5 and 1203 were violated during trading sessions. 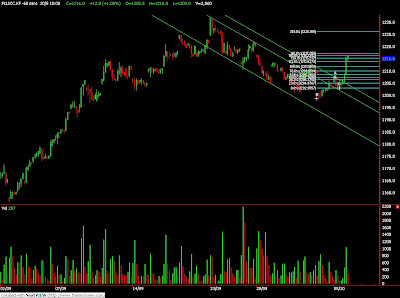 Resistance levels were seen at 1222 and 1233 regions. Oct. 5 (Bloomberg) -- Gold rose for a second day in Asia as the dollar and stock markets tumbled, boosting demand for the precious metal as an alternative investment. Holdings in the SPDR Gold Trust, the biggest exchange- traded fund backed by the metal, expanded 1.2 metric tons to 1,096.55 tons on Oct. 2, data on the company’s Web site showed. The trust’s holdings increased 3.1 percent in the past month and are 3.3 percent off the record 1,134.03 tons reached June 2. Gold for immediate delivery traded 0.3 percent higher at $1,005.65 an ounce at 2:30 p.m. in Singapore, extending last week’s 1.2 percent advance. December-delivery bullion on the Comex division of the New York Mercantile Exchange was little changed at $1,006.50 an ounce. Eleven of 24 traders, investors and analysts surveyed by Bloomberg, or 46 percent, said gold will rise this week as a weakening dollar prompts investors to buy the metal. Nine forecast lower prices and four were neutral. Gold has risen about 1.1 percent in the past month as the Dollar Index, which tracks the greenback against the currencies of six trading partners including the euro and yen, lost 1.9 percent. The benchmark MSCI Asia Pacific Index slid for a third day today to the lowest in almost a month. The October-December period is the busiest season for jewelry sales in India, the world’s largest consumer of the metal, spurred by the wedding season and the Diwali holiday. The country’s gold imports probably fell for the fifth month in September as rising prices deterred jewelry buyers, a traders’ group said Sept. 30. The country’s overseas purchases may total 50 tons in September, compared with 54 tons a year ago, said Harmesh Arora, vice president of the Bombay Bullion Association Ltd., citing preliminary data. Among other precious metals for immediate delivery, silver gained 1.1 percent to $16.3425 an ounce, platinum and palladium were little changed at $1,282 an ounce and $296 an ounce respectively. Oct. 5 (Bloomberg) -- Palm oil gained amid speculation that official figures will show that stockpiles in Malaysia, the second-largest supplier, fell last month after recent holidays in Asia. “Our expectation is that there would not be any significant increases in stock levels,” said an ECM Libra Research report today. On the supply side, “the month of September, coinciding with the Eid-al Fitr festival, would have seen less harvesting,” the report said. Eid-al Fitr is the most important Muslim holiday. The celebration sees palm oil demand increase for cooking communal meals to end the daily fast, and supplies decline as daily fasting and public holidays slow production. About 90 percent of the world’s palm oil is produced in Indonesia and Malaysia, both predominantly Muslim countries. Palm oil for December delivery on the Malaysia Derivatives Exchange gained as much as 1 percent to 2,057 ringgit ($593) a metric ton and traded at 2,052 ringgit at 12:13 p.m. local time. The contract closed at 2,037 ringgit on Oct. 5, the lowest since July 16. Malaysia’s palm oil output in August reached 1.49 million tons, the highest since a record set in November last year, the Malaysian Palm Oil Board said. That helped lift stockpiles to a six-month high of 1.42 million tons as exports fell. Monthly data is usually released on the 10th of the following month. September demand also increased ahead of China’s Mid-Autumn festival, which coincided with a weeklong nationwide holiday to mark the 60th anniversary of the Communist Party’s rule. Demand for cooking oils in China, the world’s largest consumer, typically increases during national holidays. Oct. 5 (Bloomberg) -- Crude oil declined for a second day in New York on concern about the pace of recovery in the U.S., the world’s biggest energy-consuming nation. Oil fell as economist Nouriel Roubini, the New York University professor who predicted the financial crisis, said Oct. 3 that stock and commodity markets may drop in coming months as the gradual pace of the economic recovery disappoints investors. Australian shares and Japanese stock futures dropped today after reports last week showed the U.S. lost more jobs than estimated and factory orders declined. Crude oil for November delivery fell 22 cents, or 0.3 percent, to $69.71 a barrel in electronic trading on the New York Mercantile Exchange at 11:24 a.m. Sydney time. Prices have gained 56 percent this year. Oil prices dropped as much as 3.5 percent on Oct. 2 after a report showed the U.S. jobless rate increased to a 26-year high in September. The contract fell 87 cents, or 1.2 percent, to settle at $69.95 a barrel. The U.S. unemployment rate rose to 9.8 percent, the highest since 1983, from 9.7 percent in August, the Labor Department said Oct. 2 in Washington. Australia’s benchmark S&P/ASX 200 Index fell as much as 0.2 percent in Sydney today. It was 6.9 points lower at 11:01 a.m. Sydney time. Japan’s Nikkei 225 Stock Average dipped 0.2 percent to 9,717 points at 9:12 a.m. local time. “The equity markets are starting to realize that things may have run too hard, too quickly,” Pervan said. The dollar fell to $1.4599 per euro at 11:02 a.m. Sydney time, from $1.4576 on Oct. 2. A weaker dollar increases the appeal of commodities as an alternative investment. Brent crude oil for November settlement dropped 47 cents, or 0.7 percent, to $67.60 a barrel on the London-based ICE Futures Europe exchange at 11:11 a.m. Sydney time. The contract fell $1.12, or 1.6 percent, to $68.07 a barrel on Oct. 2. Oil prices have also been depressed by rising supplies as Russia increased output 1.7 percent to a post-Soviet high in September from a year earlier after OAO Rosneft brought a new field on line in August. Total production rose to 10.01 million barrels a day from 9.84 million barrels in September last year, the Energy Ministry’s CDU-TEK unit said in an e-mailed statement Oct. 2. “Russia again saw record production levels, so that’ll hang on the market,” Pervan said. The figure puts Russian output about 25 percent higher than that of Saudi Arabia, the world’s largest producer in 2008, according to U.S. Energy Department data and Bloomberg estimates. The kingdom pumped 8.015 million barrels a day last month, according to a Bloomberg report published Oct. 1. It has cut output by 17 percent from 9.6 million barrels a day in July 2008 as part of an effort by the Organization of Petroleum Exporting Countries to curtail shipments to support prices. FKLI Oct Futures contract fall 5 points lower to settle at 1204 levels as compare to previous trading session to with a total of 3,509 lots traded in the market. FKLI was manage to recover from losing ground despite most of the regional indices were plunge tremendously during trading sessions take place. 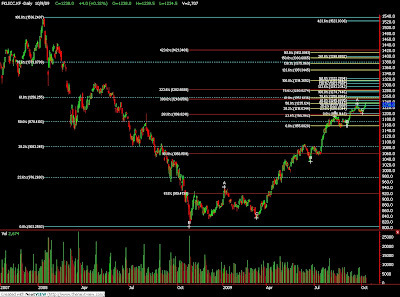 Technically, FKLI manage to rebound 50% of Fibonacci resistance levels at 1205.5 regions. Based on our technical view, our opinion suggests FKLI would trade lower in coming trading sessions provided resistance levels at 1213 and 1220 were not violated during trading sessions. Traders were advice to hold short position in the coming trading sessions while be cautious around support levels at 1200 and 1191 regions. CPO 3rd month Dec futures contract plunge RM79 lower as compare to previous trading sessions to close at RM2036 with a total of 5,744 lots traded in the market. CPO price plunge fierce during last trading hour despite not much of inducement from crude oil and soybean oil price movement. Technically, CPO price traded south once previous support levels at RM2080 fail to hold against the selling pressure during last trading hours. Based on our technical view, our opinion suggests CPO would likely to continue to trade south if support levels at RM2020 and RM2000 were not holding well against the selling pressure. 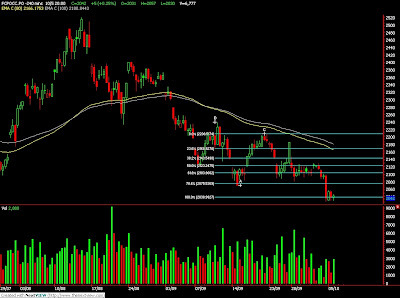 However, traders were advice to hold long position only if support levels were not violated. Resistance levels were seen at RM2070 and RM2100 regions.